This article is about the asterism. For other uses, see Big Dipper (disambiguation). The asterism of the Big Dipper (shown in this star map in green) lies within the constellation of Ursa Major. 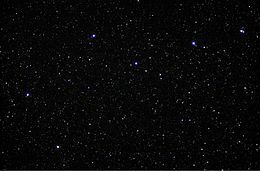 The Big Dipper (US) or the Plough (UK, Ireland) is a large asterism consisting of seven bright stars of the constellation Ursa Major; six of them are of second magnitude and one, Megrez (δ), of third magnitude. Four define a "bowl" or "body" and three define a "handle" or "head". It is recognized as a distinct grouping in many cultures. The North Star (Polaris), the current northern pole star and the tip of the handle of the Little Dipper (Little Bear), can be located by extending an imaginary line through the front two stars of the asterism, Merak (β) and Dubhe (α). This makes it useful in celestial navigation. The Big Dipper seen from Kauai. The constellation of Ursa Major (Latin: Greater Bear) has been seen as a bear, a wagon, or a ladle. The "bear" tradition is Greek, but apparently the name "bear" has parallels in Siberian or North American traditions. The name "Bear" is Homeric, and apparently native to Greece, while the "Wain" tradition is Mesopotamian. Book XVIII of Homer's Iliad mentions it as "the Bear, which men also call the Wain". In Latin, these seven stars were known as the "Seven Oxen" (septentriones, from septem triōnēs). The classical mythographer identified the "Bear" as the nymph Callisto, changed into a she-bear by Hera, the jealous wife of Zeus. In Ireland and the United Kingdom, this pattern is known as the Plough. The symbol of the Starry Plough has been used as a political symbol by Irish Republican and left wing movements. Former names include the Great Wain (i.e., wagon) or Butcher's Cleaver. The terms Charles's Wain and Charles his Wain are derived from the still older Carlswæn. A folk etymology holds that this derived from Charlemagne, but the name is common to all the Germanic languages and intended the churls' wagon (i.e., "the men's wagon"), in contrast with the women's wagon (the Little Dipper). An older "Odin's Wain" may have preceded these Nordic designations. In German, it is known as the "Great Wagon" (Großer Wagen) and, less often, the "Great Bear" (Großer Bär). In Scandinavia, it is known by variations of "Charles's Wagon" (Karlavagnen, Karlsvogna, or Karlsvognen), but also the "Great Bear" (Stora Björn). In Dutch, its official name is the "Great Bear" (Grote Beer), but it is popularly known as the "Saucepan" (Steelpannetje). In Italian, too, it is called the "Great Wagon" (Grande Carro). In Romanian and most Slavic languages, it is known as the "Great Wagon" as well. In Hungarian, it is commonly called "Göncöl's Wagon" (Göncölszekér) or, less often, "Big Göncöl" (Nagy Göncöl) after a táltos (shaman) in Hungarian mythology who carried medicine that could cure any disease. In Finnish, the figure is known as Otava with established etymology in the archaic meaning 'salmon net', although other uses of the word refer to 'bear' and 'wheel'. The bear relation is claimed to stem from the animal's resemblance to—and mythical origin from—the asterism rather than vice versa. In the Lithuanian language, the stars of Ursa Major are known as Didieji Grįžulo Ratai ("Stars of the Riding Hall's Wheels"). Other names for the constellation include Perkūno Ratai ("Wheels of Perkūnas"), Kaušas ("Bucket"), Vežimas ("Carriage"), and Samtis ("Summit"). In traditional Chinese astronomy, which continues to be used throughout East Asia (e.g., in astrology), these stars are generally considered to compose the Right Wall of the Purple Forbidden Enclosure which surrounds the Northern Celestial Pole, although numerous other groupings and names have been made over the centuries. Similarly, each star has a distinct name, which likewise has varied over time and depending upon the asterism being constructed. The Western asterism is now known as the "Northern Dipper" (北斗) or the "Seven Stars of the Northern Dipper" (Chinese and Japanese: 北斗七星; pinyin: Běidǒu Qīxīng; Cantonese Yale: Bak¹-dau² Cat¹-sing¹; rōmaji: Hokutō Shichisei; Korean: 북두칠성; romaja: Bukdu Chilseong; Vietnamese: Sao Bắc Đẩu). The personification of the Big Dipper itself is also known as "Doumu" (斗母) in Chinese folk religion and Taoism, and Marici in Buddhism. In Shinto, the seven largest stars of Ursa Major belong to Amenominakanushi, the oldest and most powerful of all kami. In North Korea, the constellation is featured on the flag of the country's special forces. In Malay, it is known as the "Boat Constellation" (Buruj Biduk); in Indonesian, as the "Canoe Stars" (Bintang Biduk). In Burmese, these stars are known as Pucwan Tārā (ပုဇွန် တာရာ, pronounced "bazun taya"). Pucwan (ပုဇွန်) is a general term for a crustacean, such as prawn, shrimp, crab, lobster, etc. In Javanese, as known as "Bintang Kartika". This name comes from Sanskrit which refers "krttikã" the same star cluster. In ancient Javanese this brightest seven stars are known as Lintang Wuluh, literally means "seven stars". This star cluster is so popular because its emergence into the sky signals the time marker for planting. In Hindu astronomy, it is referred to as the "Collection of Seven Great Sages" (Saptarshi Mandala), as each star is named after a mythical Hindu sage. An Arabian story has the four stars of the Plough's bowl as a coffin, with the three stars in the handle as mourners, following it. In Mongolian, it is known as the "Seven Gods" (Долоон бурхан). In Kazakh, they are known as the Jetiqaraqshi (Жетіқарақшы) and, in Kyrgyz, as the Jetigen (Жетиген). While its Western origins come from its resemblance to the kitchen utensil, In Filipino, the Big Dipper and its sister constellation Little Dipper are more often associated with the tabo, a hygiene tool akin to a bucket with a handle used ubiquitously in Filipino households and bathrooms. Within Ursa Major the stars of the Big Dipper have Bayer designations in consecutive Greek alphabetical order from the bowl to the handle. The Big Dipper's bowl and part of the handle photographed from the International Space Station. Mizar and Alcor are at the upper right. The Big Dipper (Ursa Major) photographed by Prof. Chen Hualin in Dakawa, Morogoro, Tanzania at midnight on February 16, 2018. Apparent Magnitude of Big Dipper stars. Click for a better view. In the same line of sight as Mizar, but about one light-year beyond it, is the star Alcor (80 UMa). Together they are known as the "Horse and Rider". At fourth magnitude, Alcor would normally be relatively easy to see with the unaided eye, but its proximity to Mizar renders it more difficult to resolve, and it has served as a traditional test of sight. Mizar itself has four components and thus enjoys the distinction of being part of an optical binary as well as being the first-discovered telescopic binary (1617) and the first-discovered spectroscopic binary (1889). 4D proper moving in -/+ 150 000 years. Five of the stars of the Big Dipper are at the core of the Ursa Major Moving Group. The two at the ends, Dubhe and Alkaid, are not part of the swarm, and are moving in the opposite direction. Relative to the central five, they are moving down and to the right in the map. This will slowly change the Dipper's shape, with the bowl opening up and the handle becoming more bent. In 50,000 years the Dipper will no longer exist as we know it [citation required], but be re-formed into a new Dipper facing the opposite way. The stars Alkaid to Phecda will then constitute the bowl, while Phecda, Merak, and Dubhe will be the handle. Polaris, the North Star, is found by imagining a line from Merak (β) to Dubhe (α) and then extending it for five times the distance between the two Pointers. Extending a line from Megrez (δ) to Phecda (γ), on the inside of the bowl, leads to Regulus (α Leonis) and Alphard (α Hydrae). A mnemonic for this is "A hole in the bowl will leak on Leo." Extending a line from Phecda (γ) to Megrez (δ) leads to Thuban (α Draconis), which was the pole star 4,000 years ago. Crossing the top of the bowl from Megrez (δ) to Dubhe (α) takes one in the direction of Capella (α Aurigae). A mnemonic for this is "Cap to Capella." Castor (α Geminorum) is reached by imagining a diagonal line from Megrez (δ) to Merak (β) and then extending it for approximately five times that distance. By following the curve of the handle from Alioth (ε) to Mizar (ζ) to Alkaid (η), one reaches Arcturus (α Boötis) and Spica (α Virginis). A mnemonic for this is "Arc to Arcturus then speed (or spike) to Spica." The approximate location of the Hubble Deep Field can be found by following a line from Phecda (γ) to Megrez (δ) and continuing on for the same distance again. Crossing the bowl diagonally from Phecda (γ) to Dubhe (α) and proceeding onward for a similar stretch leads to the bright galaxy pair M81 and M82. Two spectacular spiral galaxies flank Alkaid (η), the Pinwheel (M101) to the north and the Whirlpool (M51) to the south. Projecting a line from Alkaid through the pole star will point to Cassiopeia. The "Starry Plough", used by Irish nationalists and leftists. The "Seven Stars" referenced in the Bible's Book of Amos may refer to these stars or, more likely, to the Pleiades. In addition, the constellation has also been used in corporate logos and the Alaska flag. The seven stars on a red background of the Flag of the Community of Madrid, Spain, are the stars of the Big Dipper Asterism. It can be said the same thing about the seven stars pictured in the bordure azure of the Coat of arms of Madrid, capital of Spain. ^ Stern, David P. (23 April 2008). "Finding the Pole Star". Goddard Space Flight Center. Retrieved 31 August 2013. ^ Rao, Joe (9 May 2008). "Doorstep Astronomy: See the Big Dipper". space.com. Retrieved 31 August 2013. ^ Holbrook, J. C.; Baleisis, Audra (2008). "Naked-eye Astronomy for Cultural Astronomers". African Cultural Astronomy. Astrophysics and Space Science Proceedings. p. 53. Bibcode:2008ASSP....6...53H. doi:10.1007/978-1-4020-6639-9_5. ISBN 978-1-4020-6638-2. ^ Olson, R. J. M.; Pasachoff, J. M. (1992). "The 1816 Solar Eclipse and the Comet 1811I in Linnell's Astronomical Album". Journal for the History of Astronomy. 23: 121. Bibcode:1992JHA....23..121O. doi:10.1177/002182869202300204. ^ John C. Barentine (4 April 2016). Uncharted Constellations: Asterisms, Single-Source and Rebrands. Springer. pp. 16–. ISBN 978-3-319-27619-9. ^ Nemiroff, R.; Bonnell, J., eds. (21 April 2013). "Big Dipper". Astronomy Picture of the Day. NASA. ^ "But whence came the same idea into the minds of our North American Indians? Was it by accident? or is it evidence of a common origin in the far antiquity of Asia? The conformation of the seven stars in no way resembles the animal, — indeed the contrary; yet they called them Okuari and Paukunawa, words for a "bear," before they were visited by the white men, as is attested by Le Clercq in 1691, by the Reverend Cotton Mather in 1712, by the Jesuit missionary La Fitau in 1724, and by the French traveler Charlevoix in 1744. And Bancroft wrote in his history of our country: [...] In justice, however, to their familiarity with a bear's anatomy, it should be said that the impossible tail of our Ursa was to them either Three Hunters, or a Hunter with his two Dogs, in pursuit of the creature; the star Alcor being the pot in which they would cook her. They thus avoided the incongruousness of the present astronomical ideas of Bruin's make-up, although their cooking-utensil was inadequate. The Housatonic Indians, who roamed over that valley from Pittsfield through Lenox and Stockbridge to Great Barrington, said that this chase of the stellar Bear lasted from the spring till the autumn, when the animal was wounded and its blood plainly seen in the foliage of the forest." Allen (1899), p. 423. c.f. Richard H. Allen (28 February 2013). Star Names: Their Lore and Meaning. Courier Corporation. pp. 423–. ISBN 978-0-486-13766-7. ^ Bradley E Schaefer, The Origin of the Greek Constellations: Was the Great Bear constellation named before hunter nomads first reached the Americas more than 13,000 years ago!, Scientific American, November 2006, reviewed at The Origin of the Greek Constellations;[unreliable source?] Yuri Berezkin, The cosmic hunt: variants of a Siberian – North-American myth. Folklore, 31, 2005: 79–100. ^ Julien d'Huy reconstructs the following Palaeolithic state of the story: "There is an animal that is a horned herbivore, probably an elk. One human pursues this ungulate. The hunt proceeds to the sky. The animal is alive when it is suddenly transformed into a constellation-- It forms the Big Dipper" d'Huy Julien, Un ours dans les étoiles: recherche phylogénétique sur un mythe préhistorique, Préhistoire du sud-ouest, 20 (1), 2012: 91–106; A Cosmic Hunt in the Berber sky : a phylogenetic reconstruction of Palaeolithic mythology, Les Cahiers de l'AARS, 15, 2012. ^ Homer. "Book XVII". The Iliad. Translated by Samuel Butler. ^ "Merriam-Webster dictionary". Retrieved 2017-06-06. ^ a b Hinckley Allen, Richard (1963). "Star Names: Their Lore and Meaning – "Ursa Major"". ^ Hellquist, Elof (1922). Svensk etymologisk ordbok [Swedish etymological dictionary] (in Swedish). Karlavagnen: "I stället sammansatt" ... – "Instead composed from the appellative karl [man] in opposition to Icelandic kvennavagn [women's wagon]"
^ Kaisa, Häkkinen (2007). Nykysuomen etymologinen sanakirja (in Finnish) (4th ed.). WSOY. ISBN 978-951-0-27108-7. ^ Hämäläinen, Pirjo (11 November 2013). "Otavassa on orjan merkki". Kansan Uutiset (in Finnish). Retrieved 21 April 2014. ^ Mykrä, Sakari. "Kahdensadan nimen kontio". Suurpedot.fi (in Finnish). Archived from the original on 9 February 2013. Retrieved 21 April 2014. ^ See their individual pages. ^ KBBI Archived 2014-05-27 at the Wayback Machine. ^ Allen P. Adamson; Martin Sorrell (2007). Brandsimple: how the best brands keep it simple and succeed. Palgrave Macmillan. p. 101. ISBN 978-1-4039-8490-6. For an example see Iridium Satellite LLC.